96 Days til Disneyland - Mickey's Fun Wheel! 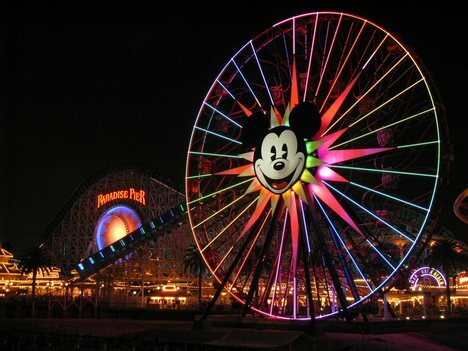 96 Days til Disneyland – Mickey’s Fun Wheel! Image courtesy and ©Chip and Co.
Perhaps more then any other attraction, Mickey’s Fun Wheel feels as much like an iconic structure, a Disney Weenie, as Sleeping Beauty Castle is. Whenever I see something on the internet with a view of Disney’s California Adventure, the thing I notice straight off is the “Ferris Wheel” with Mickey proudly displayed on the side. That, my friends, is Mickey’s Fun Wheel. While my family will be the first to tell you that I am a Ferris Wheel weenie myself — as I stay as far away from them as I can — this is one attraction that I can’t wait to try out! I think this will be an incredible photo taking attraction, that will give me some absolutely incredible shots when we get there in June! I can’t wait — only 96 Days til Disneyland! Disneyland Bound – It’s all about Walt Disney! 1 Day til Disneyland – World of Color! Previous Post: 97 Days til Disneyland – Disneyland Monorail!